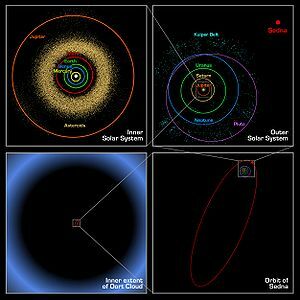 The Oort cloud, or Öpik–Oort cloud, is a cloud of comets and other objects. Astronomers believe it is way beyond the orbits of Pluto and the Kuiper belt. The Oort cloud is believed to be the source of long-period comets in the Solar System. The Oort cloud may lie about 50,000 AU, or nearly a light-year, from the Sun. This means the cloud is nearly a quarter of the way to Proxima Centauri, the nearest star to the Sun. The Kuiper belt and scattered disc, the other two reservoirs of trans-Neptunian objects, are less than one thousandth of the Oort cloud's distance. The outer limit of the Oort cloud defines the boundary of the Solar System and the region of the Sun's gravitational dominance. The Dutch astronomer Jan Hendrik Oort published the Oort cloud idea in 1950. The Oort cloud was named after him, as were the Oort comet, and Oort constants. The Oort cloud takes up a lot of space and is thought to have trillions of comets about tens of millions of kilometers apart. The Oort cloud is made up of an inner Oort cloud and an outer Oort cloud. The outer cloud is weakly bound to the Sun; long-term comets are thought to come from there. The Inner cloud is also called the Hills cloud and may be the maker of comets. The objects in the Oort cloud are believed to consist of much ice. Since the object 1996 PW was found to be a rocky body in an orbit typical of long-period comets, it is believed that rocky objects might be in the Oort cloud. The Oort cloud is thought to be the remains of a disk made out of gas which surrounded the Sun long ago. ↑ Whipple F.L. et al (1987). "A review of cometary sciences". Philosophical Transactions of the Royal Society A 323 (1572): 339–347 . doi:10.1098/rsta.1987.0090. http://rsta.royalsocietypublishing.org/content/323/1572/339.short. ↑ V. V. Emelyanenko; D.J. Asher & M.E. Bailey (2007). "The fundamental role of the Oort cloud in determining the flux of comets through the planetary system". Monthly Notices of the Royal Astronomical Society 381 (2): 779–789. doi:10.1111/j.1365-2966.2007.12269.x. http://www.blackwell-synergy.com/doi/abs/10.1111/j.1365-2966.2007.12269.x. Retrieved 2008-03-31. ↑ 3.0 3.1 Alessandro Morbidelli (2006). "Origin and dynamical evolution of comets and their reservoirs of water ammonia and methane.". arXiv:astro-ph/0512256 [astro-ph]. ↑ "Kuiper Belt & Oort Cloud". NASA Solar System Exploration web site. NASA. Retrieved 2011-08-08. ↑ Jan Oort (1950). "The structure of the cloud of comets surrounding the Solar System and a hypothesis concerning its origin" (PDF). Bull. Astron. Inst. Neth. 11: 91–110. http://articles.adsabs.harvard.edu/cgi-bin/nph-iarticle_query?1950BAN....11...91O&data_type=PDF_HIGH&type=PRINTER&filetype=.pdf. This page was last changed on 28 October 2018, at 23:20.